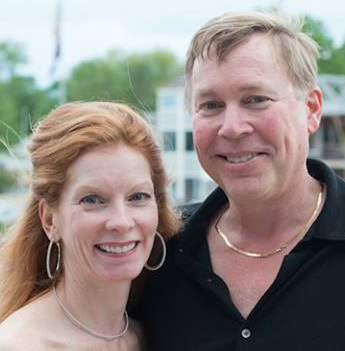 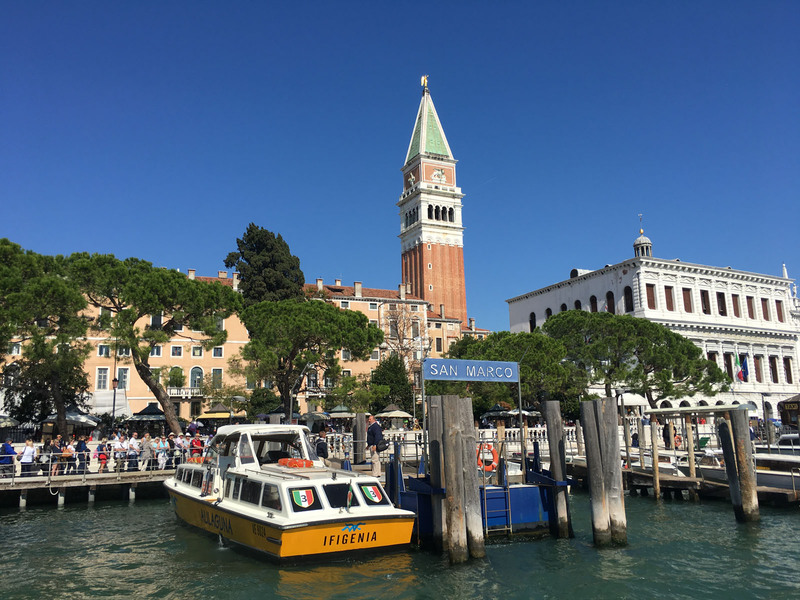 enice…You must visit Venice Italy in your lifetime, while exploring the Italian coast or before embarking on an Adriatic cruise. 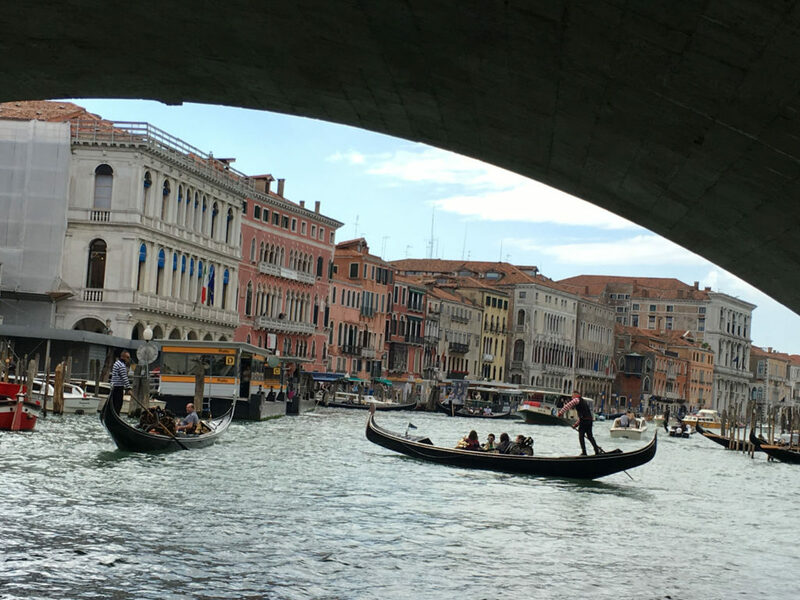 This amazing aqueduct city has inspired artists, architects, musicians and lovers for centuries. 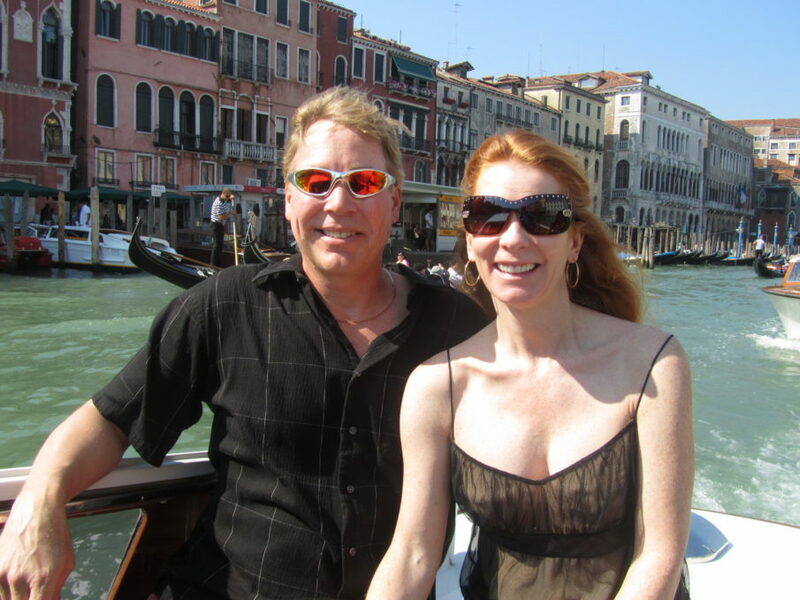 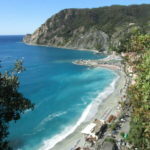 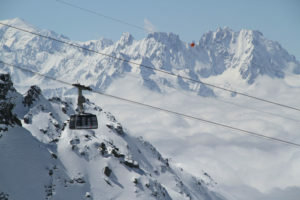 Venice is in northeastern Italy, above the captivating city of Florence (another fave) near Italy’s Soave wine region. 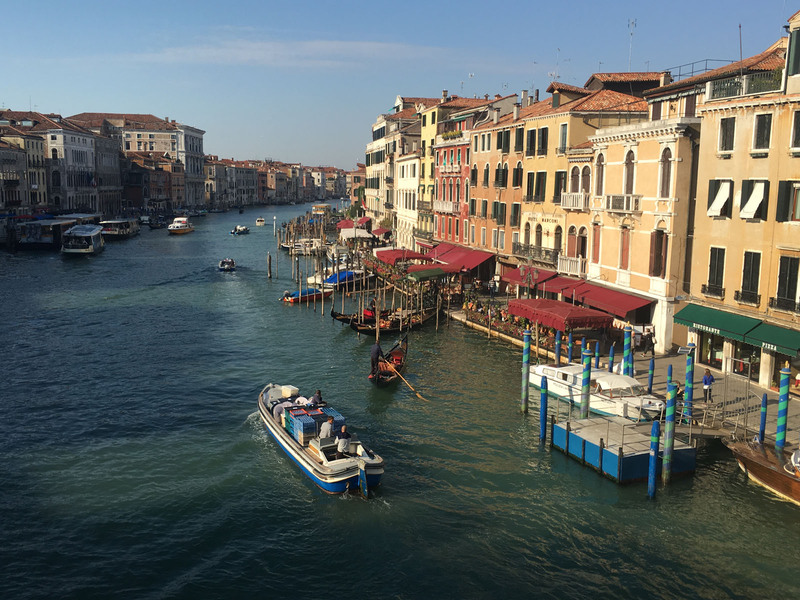 Venice is actually comprised of 118 small islands connected by over 400 canals and bridges. 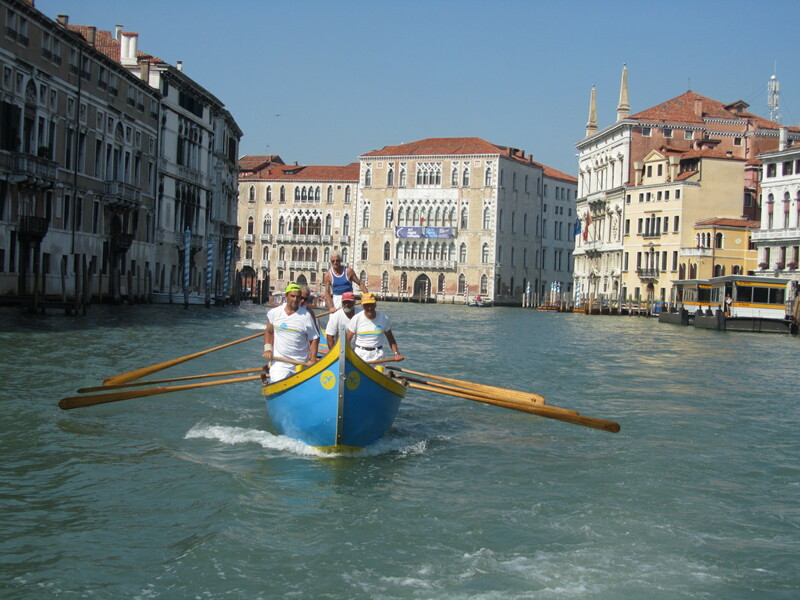 The marshy Venetian Lagoon lies between the Po and the Piave Rivers. 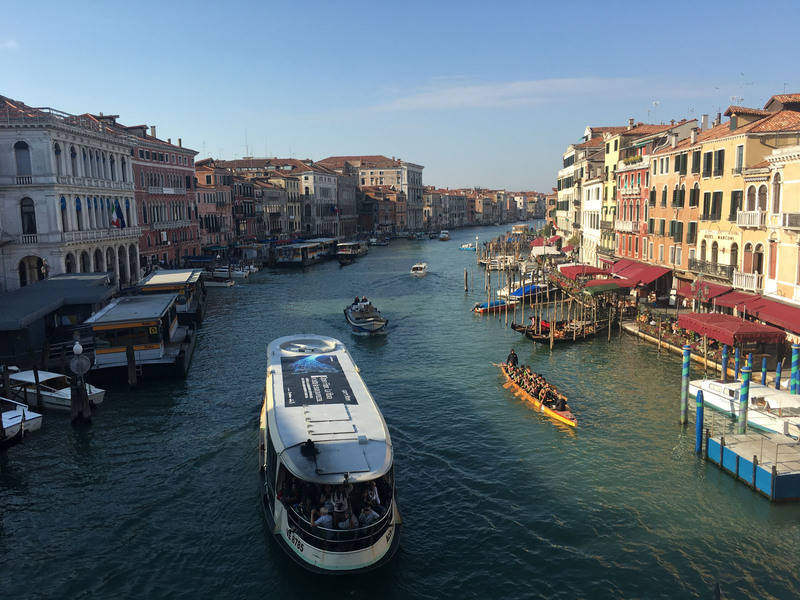 Architecturally, Venice is like no other, a floating city and a “city of canals” with tight cobblestone walkways lined with stone shops, historic hotels and delightful cafes. Venice is also incredibly confusing as each alley way starts to look the same and only leads to yet another canal and beautifully carved stone bridge. 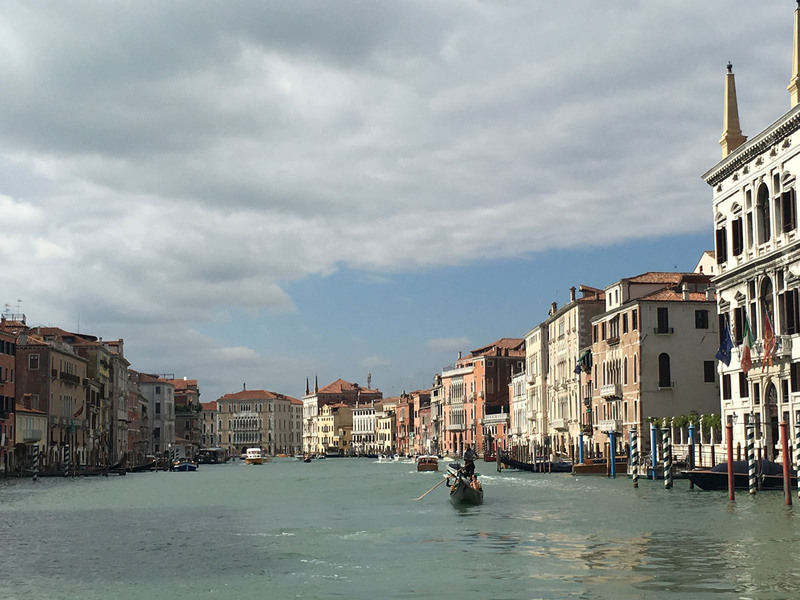 Venice is a marvel to explore. 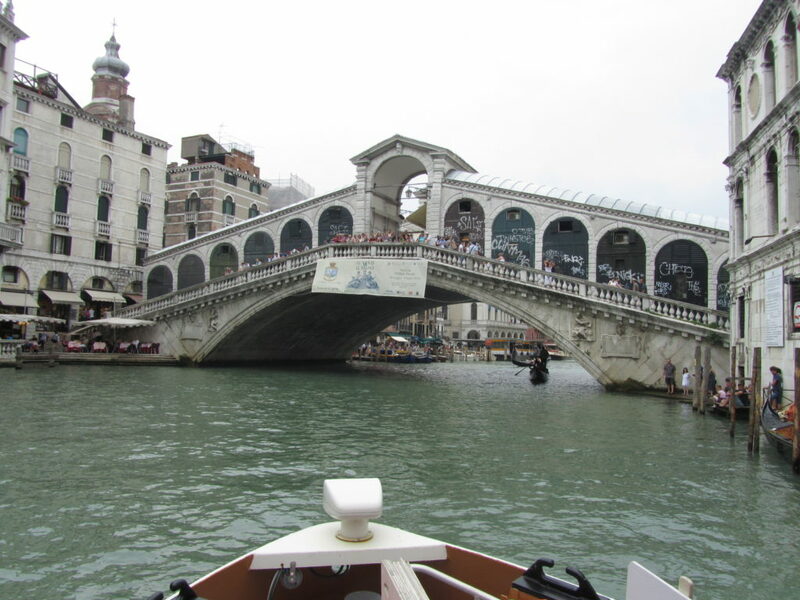 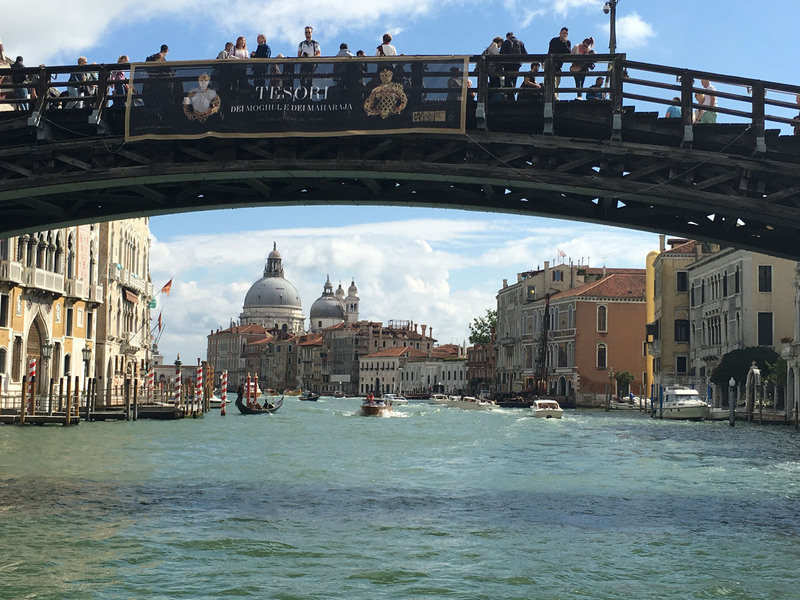 A boat ride in a Vaporetto up Venice’s Grand Canal is a grand entry. 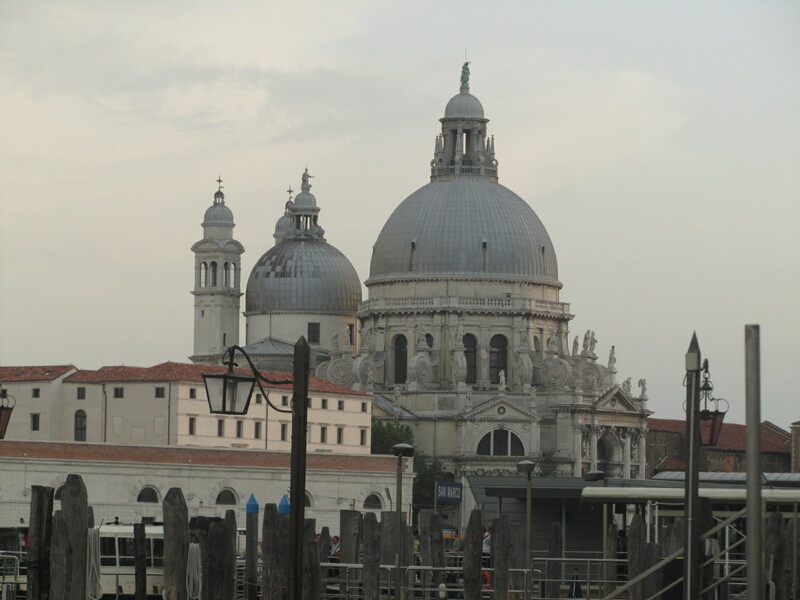 Magnificent stone buildings emerge from the water, seemingly suspended on the sea, no green lawn or land. 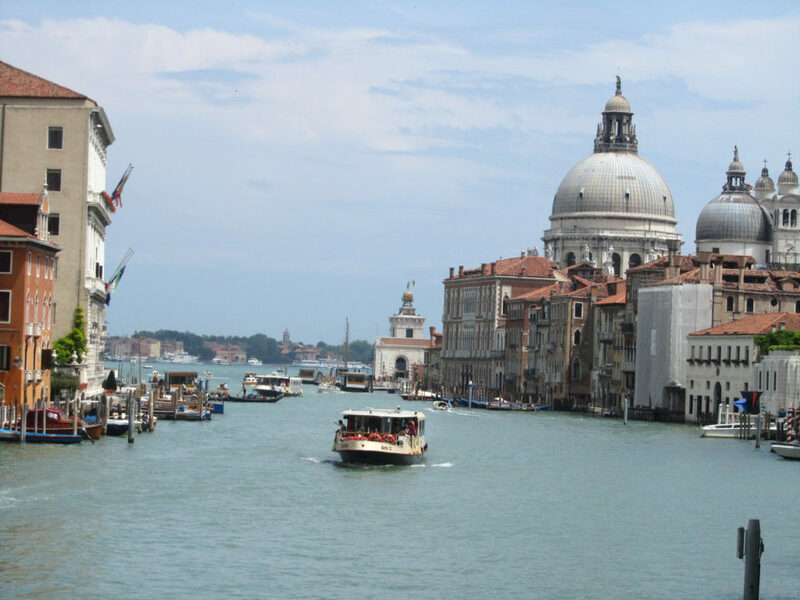 The entire island is constructed on wooden piles, still original, after centuries of salty sea exposure, and decades of scientific predictions that Venice will sink. 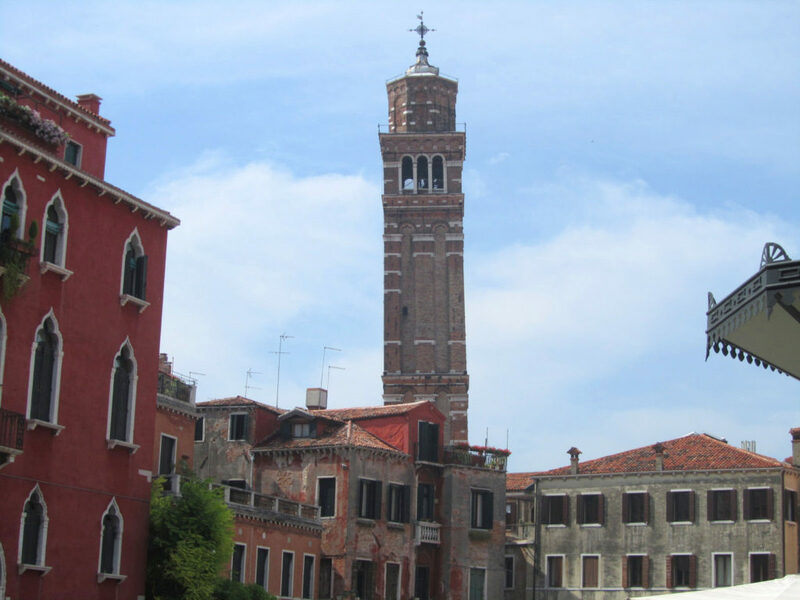 The grand brick palaces and heavy stone church foundations are supported only by wood pylons, sand, mud and clay. 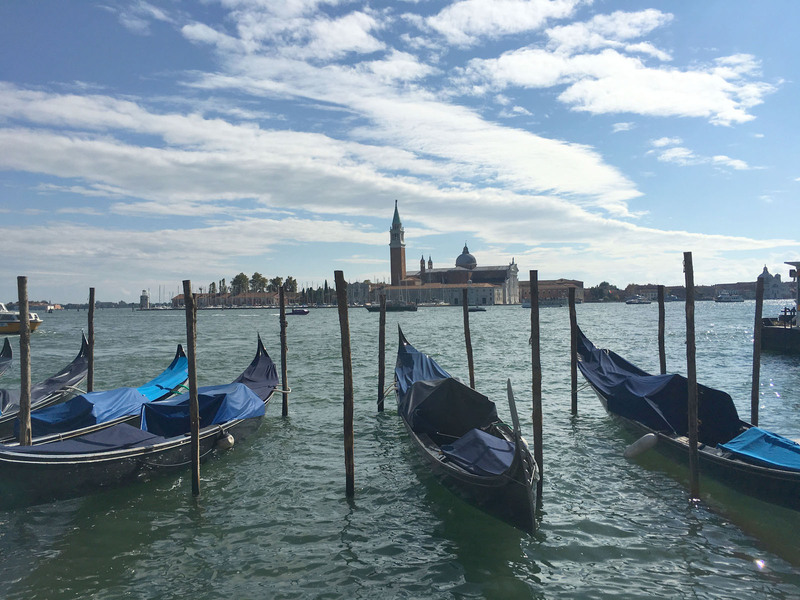 Amazing that the alder wood has not decayed and that Venice hasn’t collapsed, but these tree trunks are actually preserved by the sea salt, even when Venice floods in winter months, as evidenced by the rain boots sold in shops and high watermarks throughout the city. 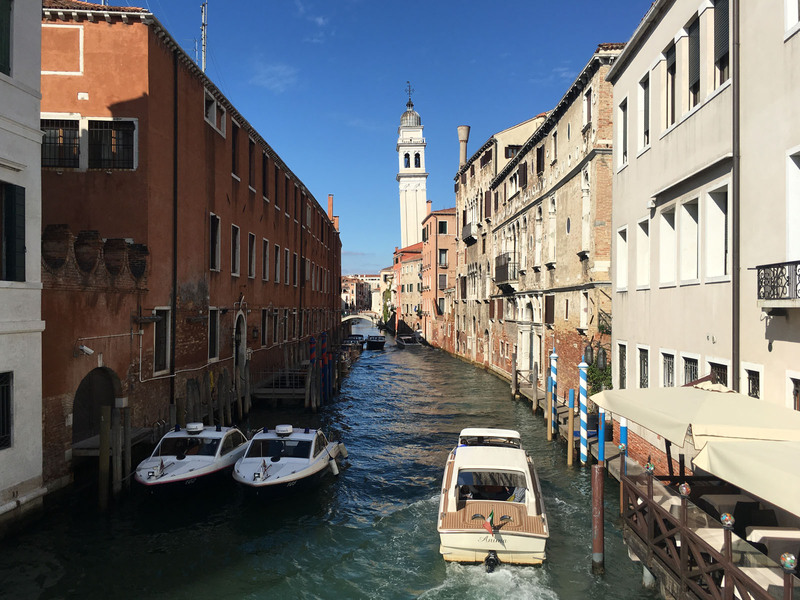 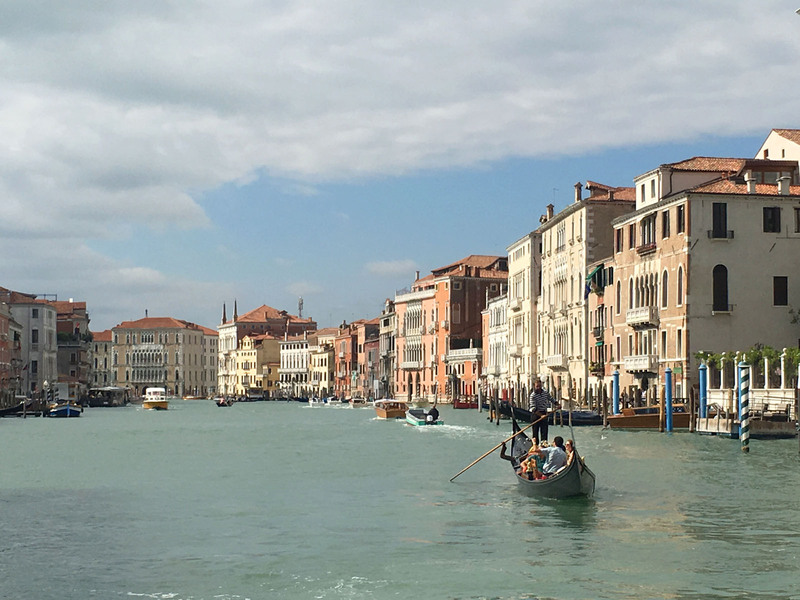 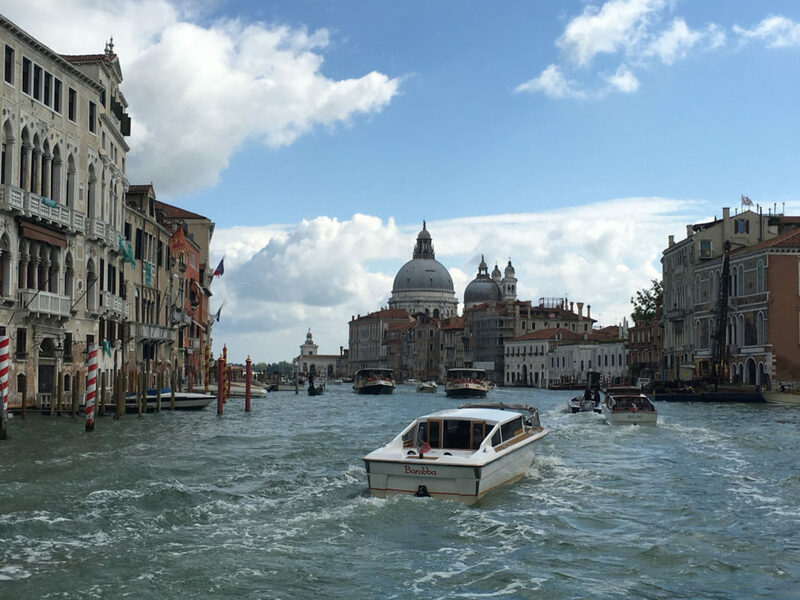 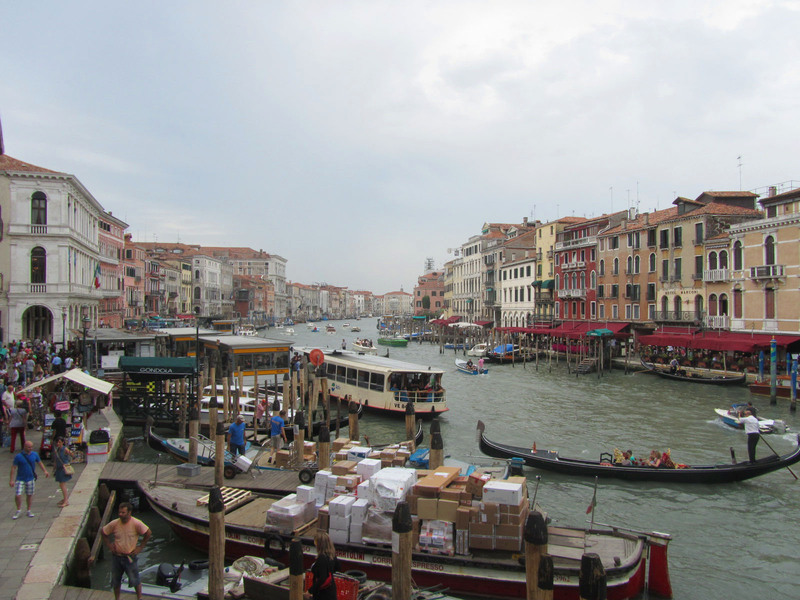 Strolling Venice’s complicated canal streets, and get lost – its expected and recommended. 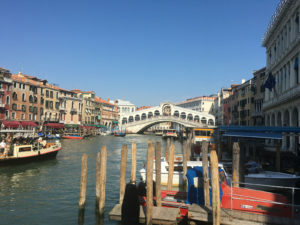 The beauty of Venice is best enjoyed by flowing with the stone walkways along the water, discovering classic cafes and the grand Piazza squares, enjoying Italian cappuccino overlooking a canalway, admiring Venetian masks, jewelry, glasswork and handmade lace in the myriad of boutiques..
San Marco’s Piazza and Church is the heart and soul of Venice. 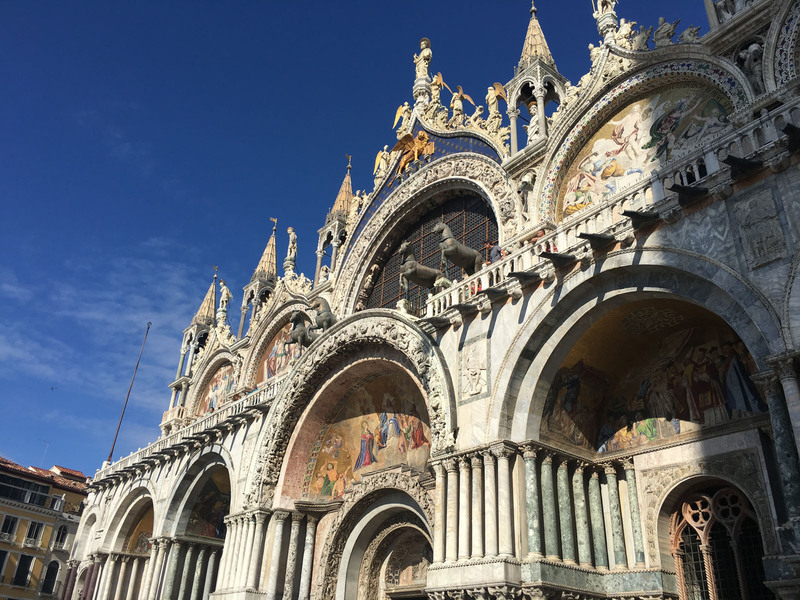 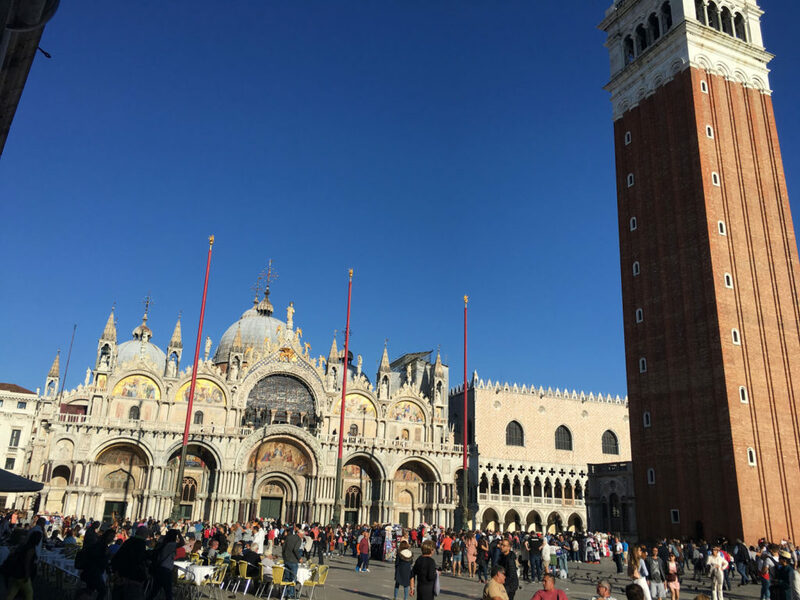 The massive St Mark’s Square is a carnival of tour groups, tourists, cart sales and colors by day and extraordinary large and looming at night with St Mark’s Basilica as its grand focal point. 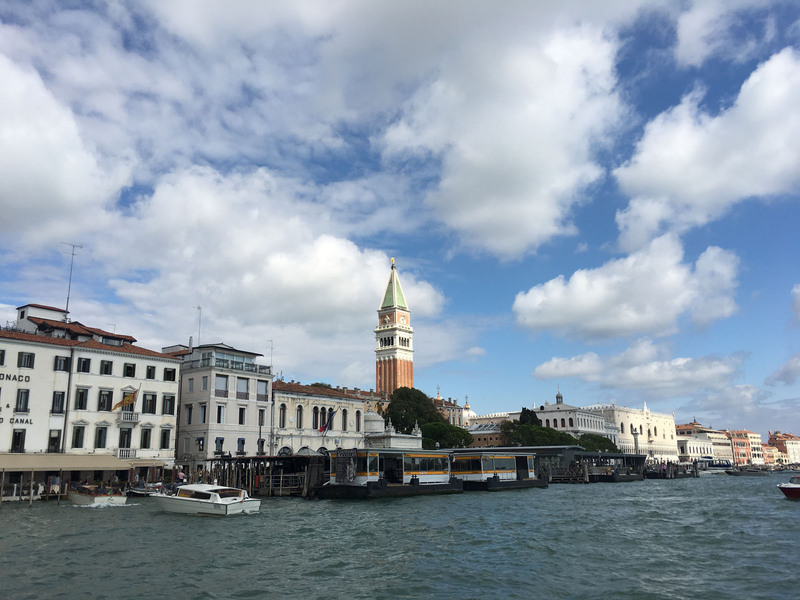 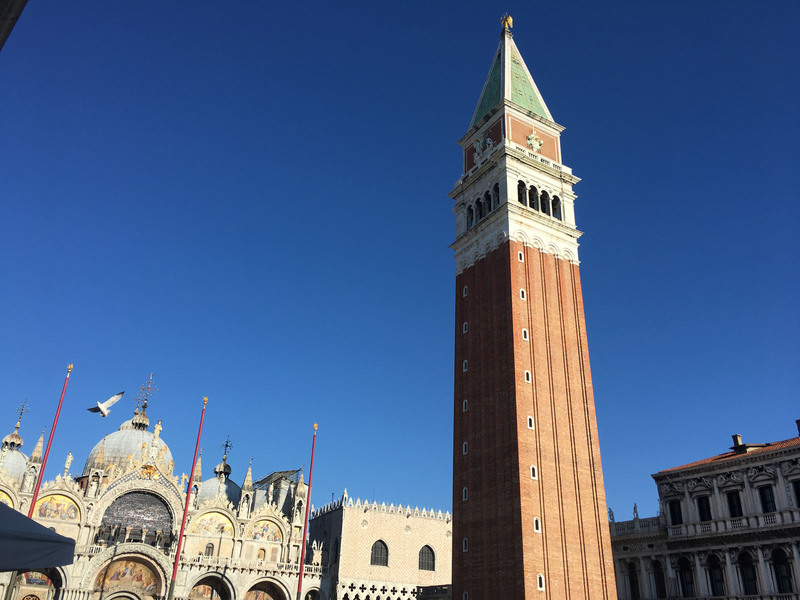 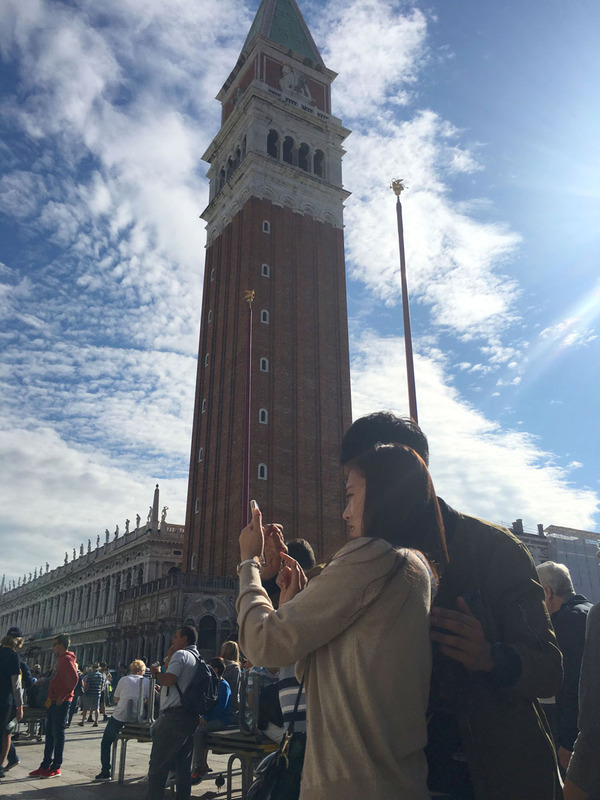 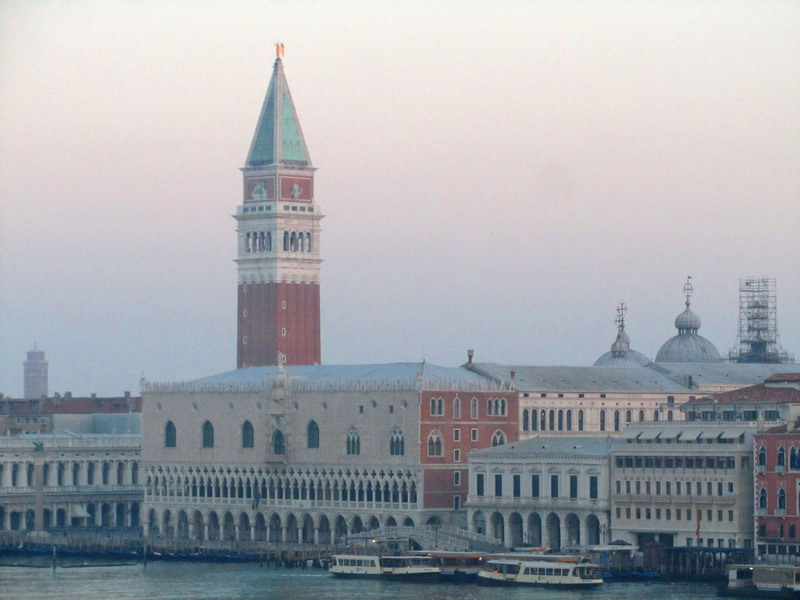 For the best view, The Campanile…Climb the Campanile early morning, up the elevator to the top of St Mark’s Square bell tower for amazing views of the city and out to sea (not for those who fear heights however). 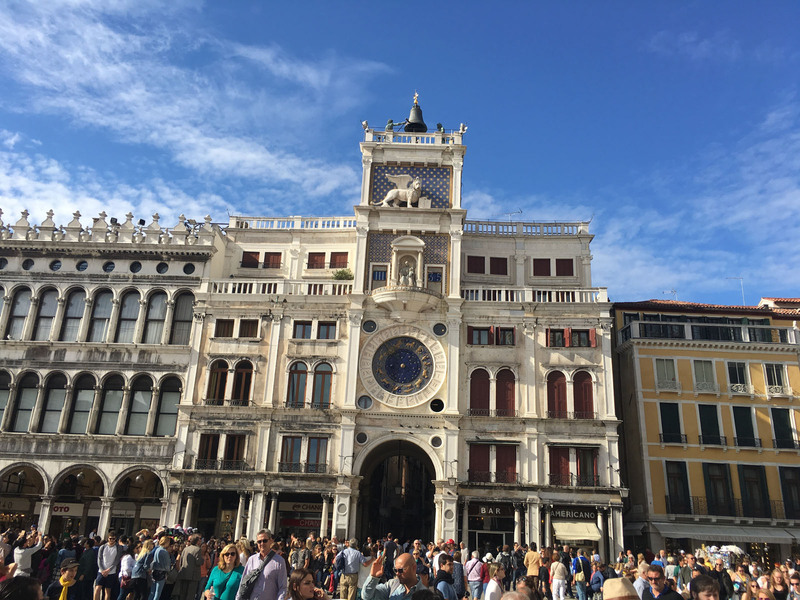 The Doge’s Palace, and the Bridge of Sighs, is another must stop to see the wealth and fascination with art and music of the aristocracy of Venice. 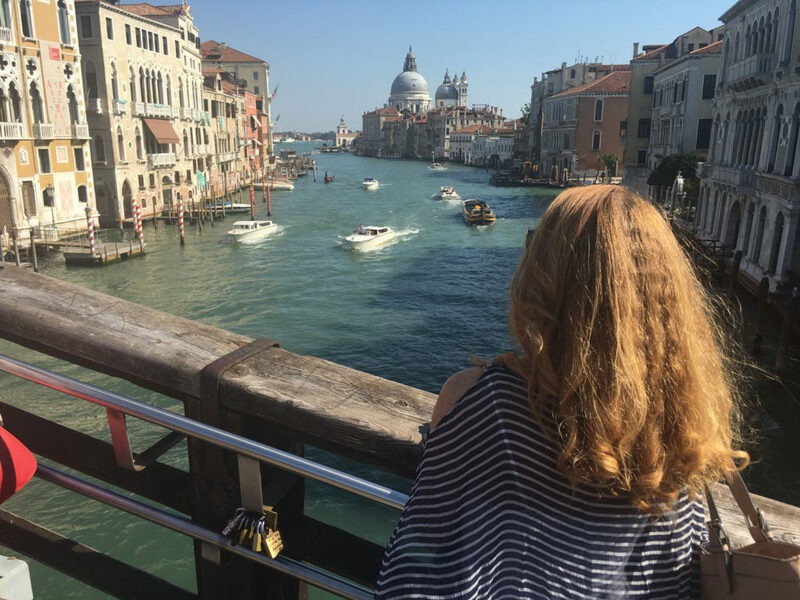 On the flip side, imagine the last view of the sea and sunlight for prisoners in medieval and renaissance times as they passed over the Bridge of Sighs to their imprisonment. 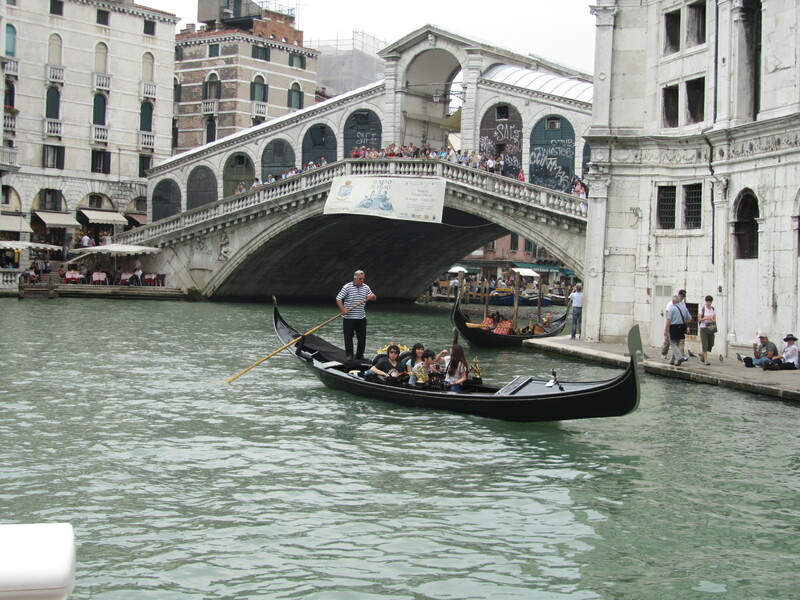 Venice in the Middle Ages and Renaissance was the hub for the Crusades and a key commerce center given its sea ways. 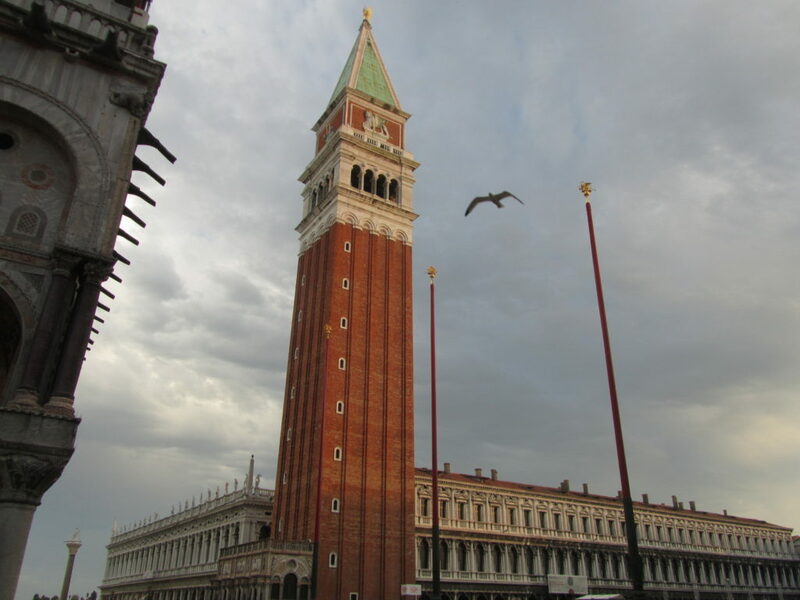 From the 13-17th century, Venice thrived on trading of silk, grain, and spice. Venice’s art scene therefore flourished with opera (home of Vivaldi) and symphony and fine art. 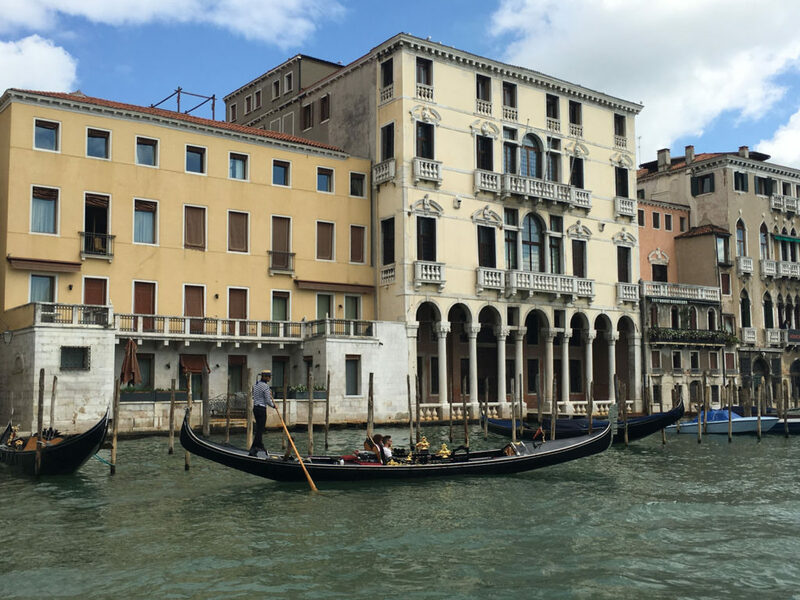 You sense the history and wealth as you explore Venice’s narrow winding walkways and see the extravagant detail on doorways, bridges and storefronts. 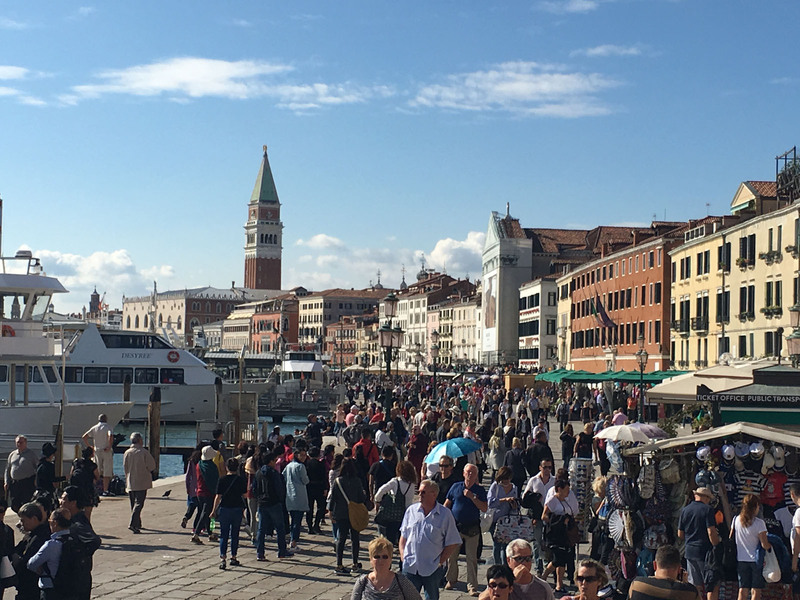 Rialto Market is amazing, a lively outdoor Italian market where locals sell their wares, fresh fish – with heads and tails and tentacles attached. 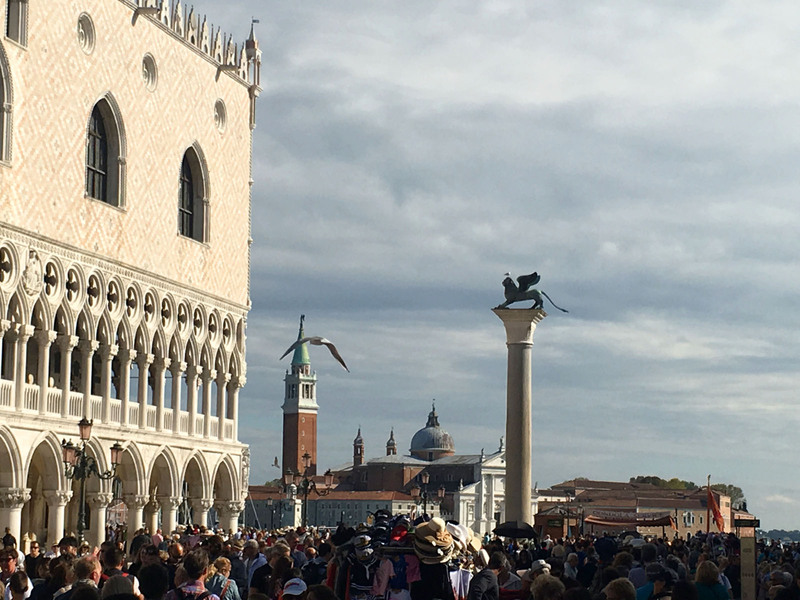 Beautiful vegetable and flowers line the Rialto Square along with sunglasses, hats, jewelry, leather bags and masks from global vendors. 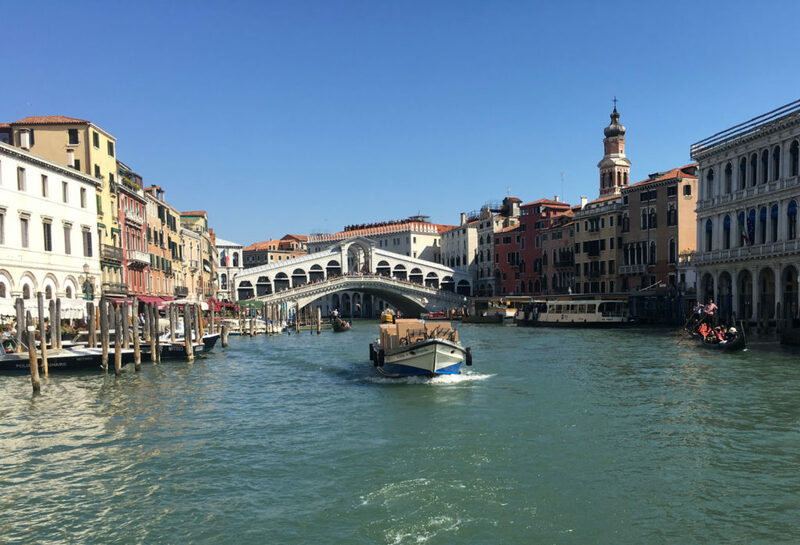 The Rialto Bridge is a photographer’s dream, where many lovers have proclaimed their passions… Venice is romantic and notably more so at night when day visitors and cruise ship passengers have left the lovely streets more calm and quiet. 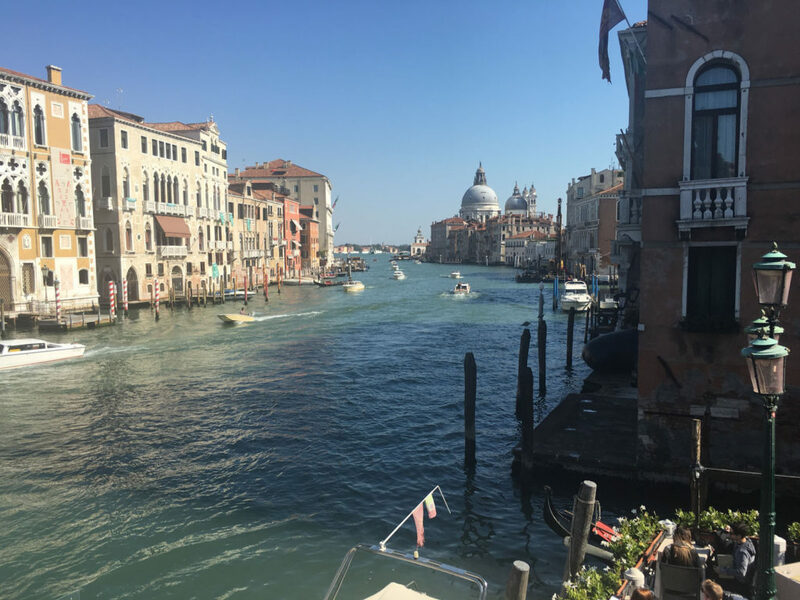 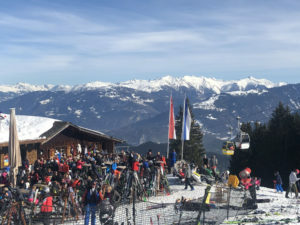 We enjoyed dining out at an alfresco café, sharing a carafe of local wine, grissini (surprisingly hard bread), panino and fish soup (paella), and risotto. After dinner, a gelato as you roam the riverfront streets is the perfect conclusion. 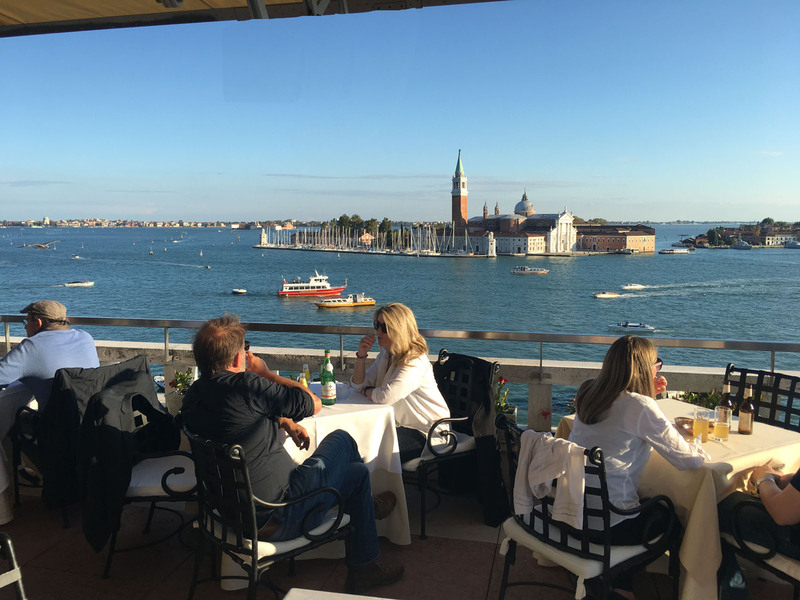 For a priceless Venice sunset, and pricey cocktails at $20 Eu each, Hotel Danieli’s rooftop Terrazza bar is spectacular, but you’ve been warned of the dive bombing pigeons, prices and persnickety waiters. 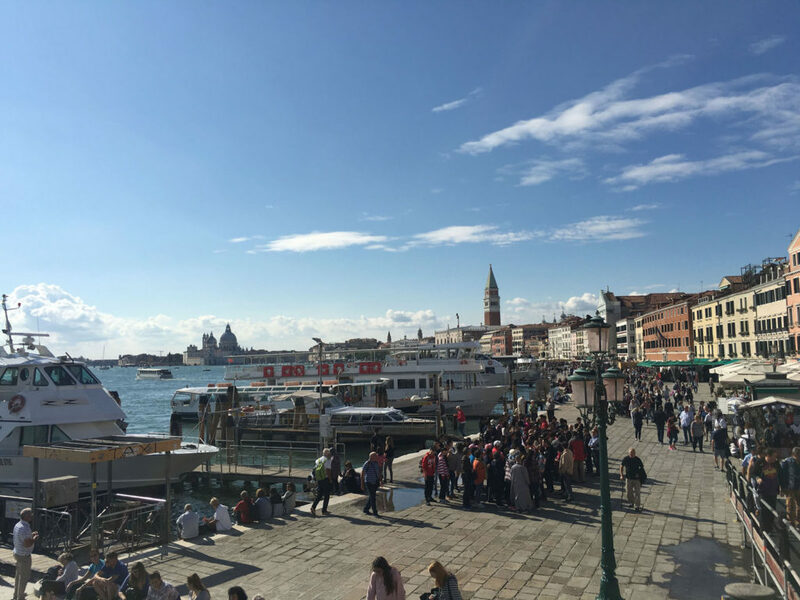 Eat Venice, so many fantastic Italian cafes and restaurants. 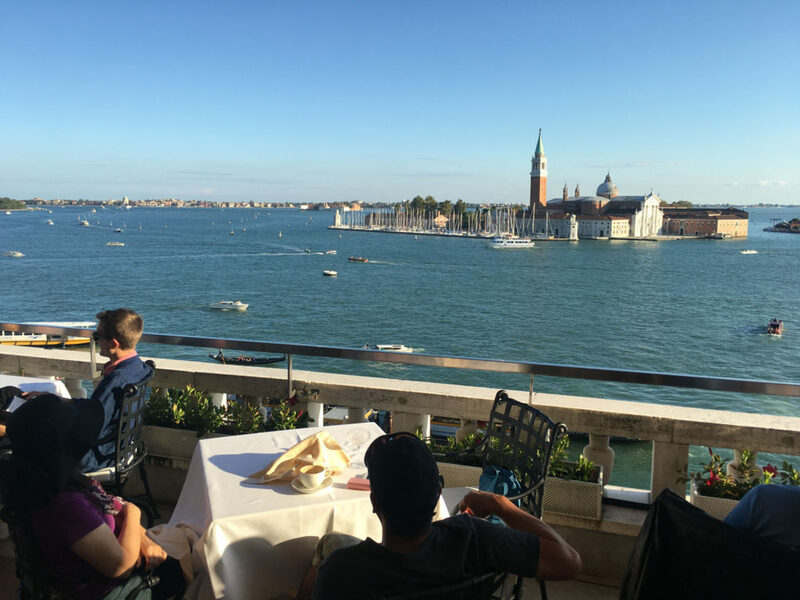 Dine alfresco at a café over a carafe of local wine, grissini (crunchy long breadsticks), panino and fish soup (paella), and risotto. 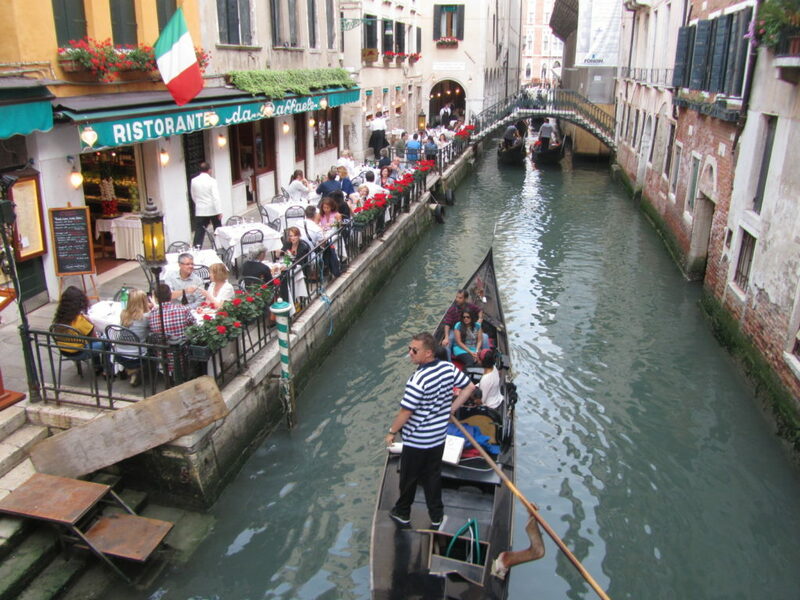 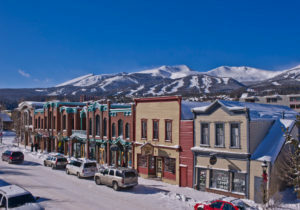 Or find a cozy spot, like Al Vecio Canton for authentic Italian fare and hospitality. 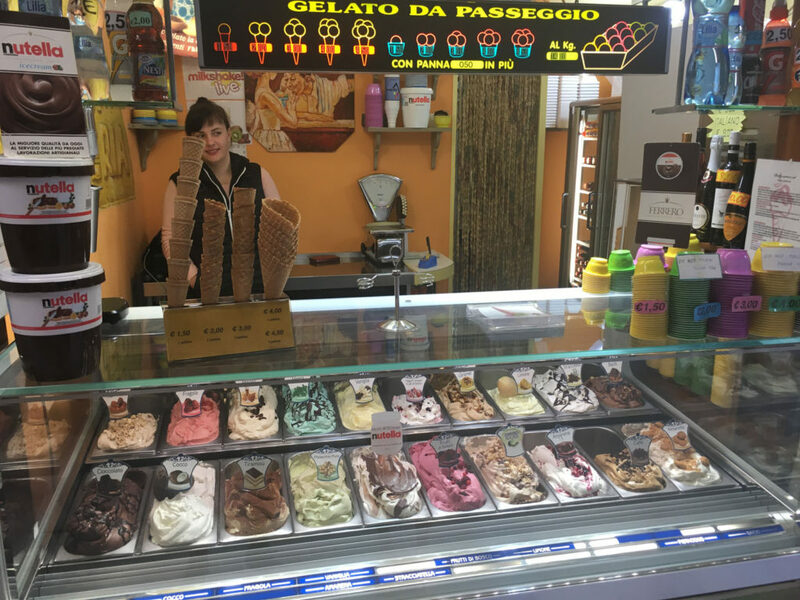 Gelato is a tradition, after dinner, as you stroll the riverfront streets – the perfect conclusion. 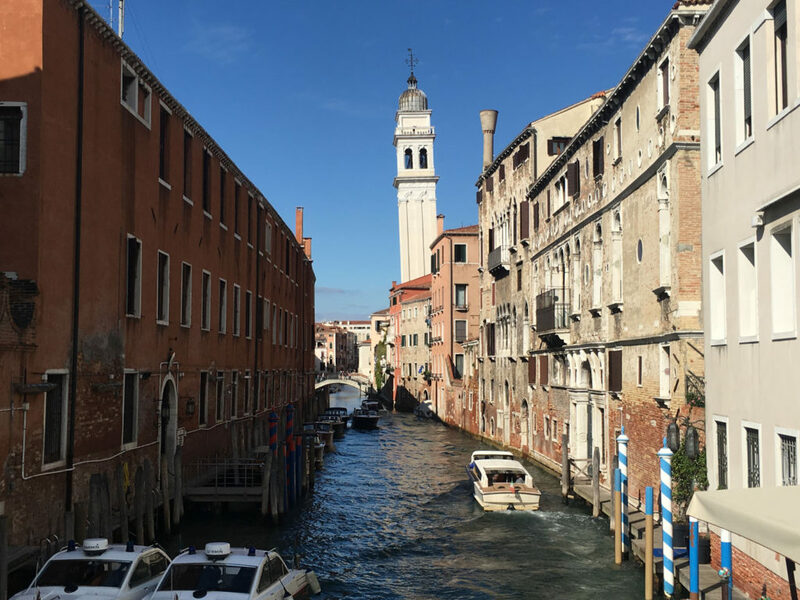 Two days in Venice is our recommendation, this classic canal enclave is amazing on your first visit, the centuries’ old architecture and beautiful little boutiques selling art, Venetian lace and masks are magical at first pass. 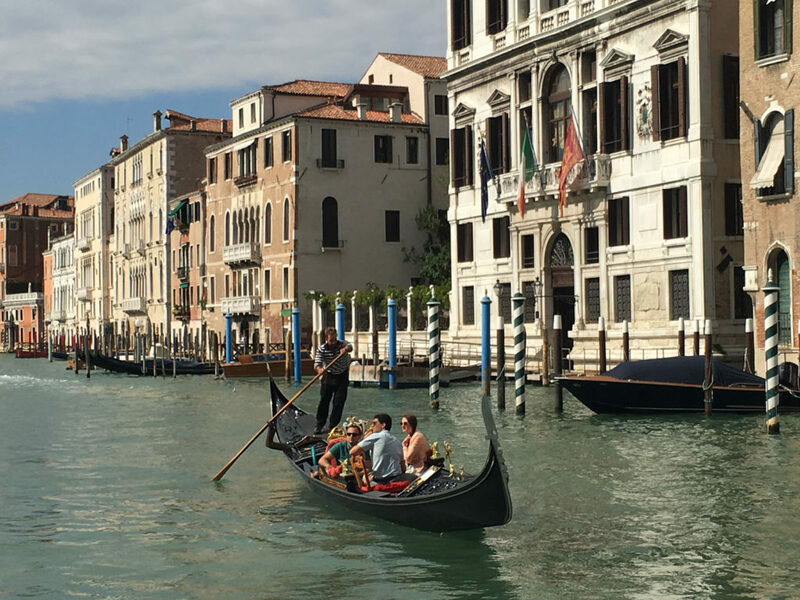 This classic “City of Canals” and “City of Masks” is magical at first, but sweltering on summer days as you navigate through throngs of tourists. 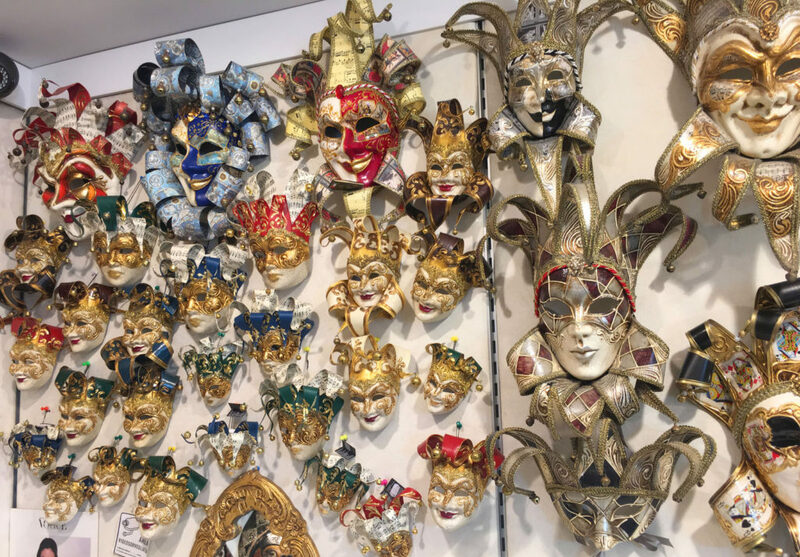 Soon each unique mask shops and gelato stand begins to blur. 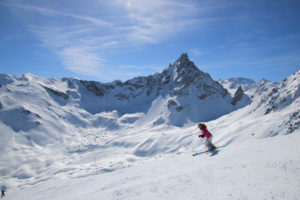 That’s a sign its time to navigate your way to more intimate Italy like Cinque Terre– the Italian Riviera, to Florence, or out to sea for an Adriatic cruise from Venice to Croatia and Slovenia.